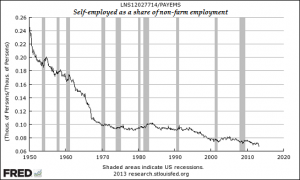 New data show a continued sharp decline in self-employed businesses in the United States. This is another indication that the “recovery” from the Great Recession is bogus. Things only are slightly less bad than before. The decline comes as government taxes and regulations continue metastasizing. Big businesses can handle the government cancer because they have vast staffs of lawyers and accountants. Small businesses, especially the self-empllyed, can’t afford such treatments, are defenseless against the government cancer, and often die. In particular, Obamacare, with its absurd regulations and taxes/penalties, is slamming those not part of the System.